Hello, my name is Scott, and I’m an Apple TV addict. I haven’t been one for long — only since a couple days after Christmas. But unlike some addictions, this one was instantaneous. One of the things about the Apple TV addiction that you need to understand is that your level of addiction will depend heavily upon you. The Apple TV doesn’t attempt to be the ultimate media center for all people, and it’s not. But it is perfect for certain people. More on that later. Apple TV’s simplicity in purpose is mirrored by its simplicity in setup and operation. Apple TV has five connections on the back: power, HDMI, Micro USB, optical audio, ethernet. For me, two of these connections were all that were needed. Our modest home entertainment system consists of a Sony Bravia LCD TV, the Apple TV, a FIOS HD TV receiver, a Toshiba CD/DVD player, and a Sony audio receiver with surround sound and five speakers. Before the Apple TV, I had a Core Duo Mac Mini connected to the TV as a media computer for watching iTunes and Netflix content. I connected the Apple TV to our Sony Bravia LCD TV with an HDMI cable. Besides the HDMI cable, the only other cable sticking out the back of the Apple TV is the power cord. The FIOS receiver is also connected to the TV with an HDMI cable. An optical cable from the TV to the audio receiver gets the sound to the surround sound system. It’s a simple set up, and the Apple TV in no way necessitates any additional physical complexity. Once the Apple TV is installed, there’s a set up process you’ll run through. It’s somewhat painless — I say somewhat, because there is some typing required, and that typing is completed by using the remote to select characters one at a time. You’ll need to enter your network password if you’re connecting over WiFi, your iTunes username and password if you enable Home Sharing so that you can stream iTunes content from your computers, and finally, your Netflix username and password if you have a Netflix account. The simplicity continues in the operational user interface. 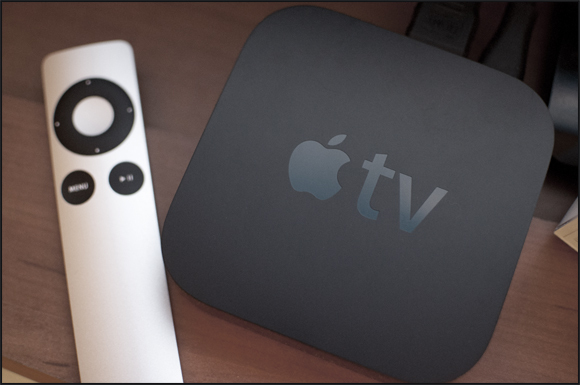 Apple TV allows access to several different types of content — iTunes movies, TV shows, and movie trailers, podcasts, Flickr and MobileMe photo albums, and Netflix movies, among other sources. The user interface is consistent across all of these sources in how selections are made and content is displayed for choosing what to view or watch. This consistency makes it simple to use, and provides a cleaner interface to some of the sources, such as Netflix. The Apple TV Netflix interface has been described as one of the cleaner interfaces available on any TV set top box. These are all nice attributes for a TV set top box to have, but they are only part of the reason for the addictive quality of the Apple TV. The real reason is the easy access to iTunes content, including movies stored in iTunes on computers on the local network, and Netflix content. That combination is powerful in our household. We have a Netflix account, and we have several of our daughter’s movies in an iTunes library on her Mac mini in the computer room. The ease with which the Apple TV makes it possible to view content from those sources on our TV in the family room is where it shines brightly. It’s such a part of our viewing now, that my preschool daughter sometimes thinks that watching TV is synonymous with watching Apple TV. I fully appreciate that not everyone will be as vulnerable to the Apple TV addiction as I was. If you’re a person who wants to be able to watch programs available on Hulu or Amazon Instant Video, you’ll be disappointed in the Apple TV. If you don’t have iTunes content or don’t like renting movies or TV shows through iTunes, you’ll have another reason to be less enamored with the Apple TV. Finally, if you don’t have a Netflix account and don’t want one, that’ll be another strike against the Apple TV. It really only will have the same no-brainer instant purchase power that it had for me if you use iTunes and Netflix for sustaining your TV show and movie viewing habits. For our family, Apple TV makes sense, is easy to use, and at $99 it can’t be beat. After having lived with it for a couple months now, I can state that it’s an addiction I don’t see myself trying to shake anytime soon.